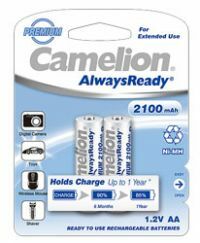 This AlwaysReady is a Pre-charged Long-life rechargeable battery that saves energy and money. It provides excellent performance over both Conventional Dry-cell batteries and other Rechargeable batteries. One of its best advantages is able to maintain 85% the capacity after 1 year of storage once fully charged.Ideal for all High Drain Devices, such as Digital Camera, Photo Flash or Game Controller etc.Best ideal for everyday devices, such as dect phone, remote control and torch etc. 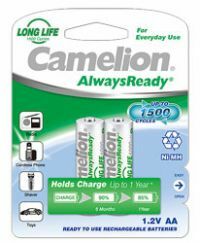 To Recieve updates and possible rewards for Camelion AA 2300 mAh AlwaysReady please sign in. To Recieve updates and possible rewards for Rechargeable Battery please sign in.